Left to Right: Darren Pettie, Heather Burns, Jeremy Shamos, and Marin Hinkle. Photo by Jeremy Daniel. BOTTOM LINE: This welcome revival of a Pulitzer-winning divorce comedy is presented with depth, but could use a little igniting. Marriage and divorce were portrayed quite differently in the media when Donald Margulies' divorce comedy won the Pulitzer Prize in 2000. Roundabout Theatre has remounted Margulies' play in its first major New York production since it premiered off Broadway almost fifteen years ago. In comparison to today, the vast majority of marriages on screen had funny little skirmishes in comedy or scandalous affairs in drama. There was little talk in plays, theater, or film about what happens when a fairly "normal" group of upper middle class Americans have to deal with the toils of marriage without any other real problems in life on which to blame their shortcomings. This is perhaps why the play won the Pulitzer Prize, and why it probably wouldn't be awarded the same prize today. Nevertheless, it's still a good play. While not as revelatory, Dinner with Friends entertains even if it doesn't enlighten. Karen (Marin Hinkle) and Gabe (Jeremy Shamos) are the kind of middle-aged married couple that have become experts at being life partners, if not always romantic partners. They have mastered the fine art of polenta cakes and European travel. Their closest friends are the younger Beth (Heather Burns) and Tom (Darren Pettie) who they actually set up a dozen years ago. One of Margulies' best decisions was putting that meet-up scene later in the play out of linear order. They've since married and had two kids (like Karen and Gabe). The conversation at the opening dinner party is supposed to be about Karen and Gabe's recent trip to Italy over some wine and french press coffee. Unexpectedly, Beth drops the bombshell that she and Tom are getting a divorce because Tom has fallen in love with a stewardess/travel agent. Gabe, who normally has plenty to talk about in terms of wine tannins and zucchini, is struck dumb at such a major issue. Tom and Beth had planned to tell them together, and he will not allow Beth to brainwash their friends into siding with her. After a heated and somewhat awkward argument he heads over to Gabe and Karen's to set the story straight. Against Karen's will they are civil with him as he seeks almost parental support from his old friends. Food is a major theme, including who is eating and who is cooking for whom. Gabe feeds Tom as we see another relationship between two old friends crumble because of divorce. In fact, Gabe and Tom's relationship is the only one we actually witness breaking in real time throughout the play. Shamos and Pettie find an extraordinary balance of heart and humor in these moments. Pam MacKinnon is a natural choice to direct coming off her Tony Award-winning turn at a far more troubled married couple in Edward Albee's Who's Afraid of Virginia Woolf. Here she mines Margulies' characters for every shred of deeper humanity. Occasionally there are nuances that would get plowed right through in a speedier take on the tempo, but too often she comes up short looking for more that just isn't there in the text. Yet she directs a sharp and polished production which is a must with this meticulous and openly manipulative script. Margulies was playing off the shallowness of those sitcom marriages by creating caricatures of narcissistic couples who end up dealing with issues that are not so conventional. The parody is lost in the more somber moments in this production. Jane Cox's lighting is occasionally too dark to give the needed levity. Illona Somogyi's bright costumes and Allen Moyer's overtly contemporary scenic design help in keeping more with the spirit of the script even if there are some clashes in overall tone. 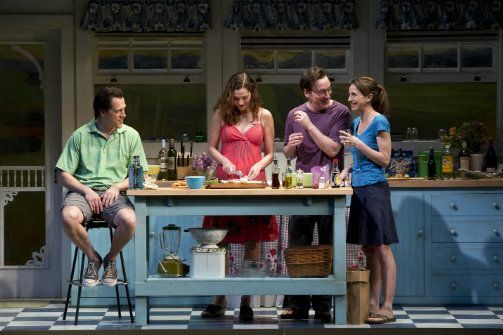 The result of trying to have us relate to these characters too closely is that they become far too unlikable to consider the issues and philosophy of marriage at hand, which is where the real gems of Margulies' play exist. There's a balance between what is believable behavior and what Margulies is exaggerating for impact and humor. A few scenes that are meant to fly by are unfortunately languished in and force us to ponder the selflessness of these characters instead of laughing and questioning our own beliefs surrounding marriage. In general the duet scenes with Shamos and Pettie benefit the most from MacKinnon's sensitivity. It's the fights that could use some of the rip roaring velocity that was present in Virginia Woolf. Ms. Burns, a talented screen actress, has a disarming natural quality that works wonderfully in the comedic scenes, but which can underwhelm her character in the more pivotal moments of the script. Meanwhile Ms. Hinkle strongly plays Karen as the motherly cog that has kept these relationships afloat. In the end, it is Karen's willingness to endure periods of disconnect in her marriage, and Gabe's ability to rejuvenate their love, that speak to the defense against boredom and the wandering eye.